By necessity, coach Darnell Taylor starts five guards. That can create some mismatches on both sides of the ball for the West Seattle High School girls basketball team. It also gives the smallish Wildcats a unique attacking playing style. At the center of the team’s versatility is the team’s tallest player, 5-foot-11 junior Meghan Fiso. Fiso, who committed to the University of Michigan on her 17th birthday on Feb. 8, is an undersized post player with guard skills. 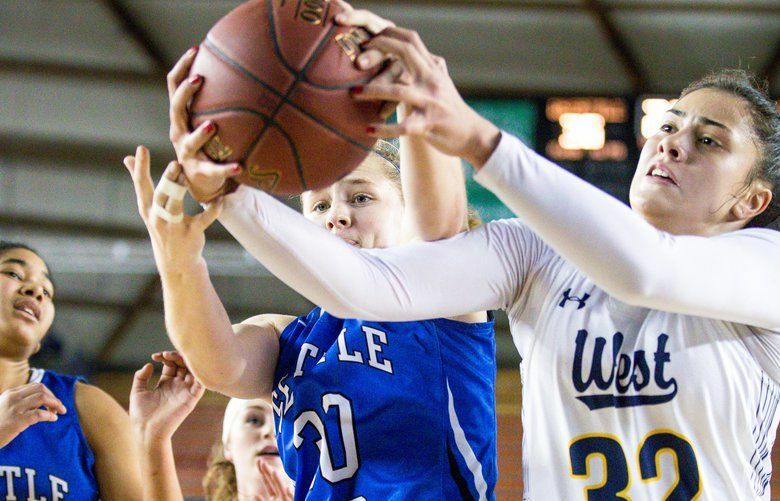 Her willingness to guard the opposition’s tallest player, such as the likes of Garfield’s 6-3 standout Dalayah Daniels in Metro League play, has been a big key to the Wildcats’ success. Fiso, who joins two older sisters who played high-school basketball, can either post up smaller players inside or pop outside to shoot three-pointers or her patented midrange shot. “I’ve been telling her forever, she’s either faster or stronger with her size,” Taylor said. “Whoever they put on her, she’s either faster or stronger. We try to attack that matchup. Essentially, we play her at every position. Despite what role Fiso is playing for West Seattle inside, she and her coach insist she’s a guard. Whatever the position, she’s productive with averages of 12.9 points, 7.2 rebounds, 2.3 assists and near 50-percent shooting. Fiso helped West Seattle (18-5) get to back to the Class 3A state tournament in the Tacoma Dome for the third season in a row. The Wildcats, a 41-40 survivor over Meadowdale in Friday’s loser-out regional game, advanced to a Wednesday loser-out state opener in the Dome at 2 p.m. against Arlington (17-6). Wednesday’s game is likely to be fast paced with two teams who like to push tempo. Arlington likes to pressure full court on defense, like West Seattle, and averages 28 three-point attempts a game. The Wildcats reached the Class 3A semifinals last season, only to fall to eventual state champion Gig Harbor 55-46. Fiso and sophomore Julianna Horne join seniors Grace Sarver, Jasmine Gayles and Kelsey Lenzie in the starting lineup. Fiso and the team’s six seniors met on the basketball court as third-graders and have been playing together since. A memorable senior send-off would be fitting by cutting down the nets Saturday after winning a state title. “We can put five strong girls on the floor who have been playing together for a long time, so we didn’t have to build chemistry,” Fiso said. “We’re really talented and we’re all Division 1 players. I think that’s helped changed the whole West Seattle culture around. It’s been really special, just growing up with these girls and seeing how they’ve all developed their games and gotten so much better since we were younger. Top storylines: The Metro League has flexed its collective muscle in the postseason, advancing four teams to state, led by third-seeded Garfield (22-2) reaching the quarterfinals on Thursday. Seattle Prep (19-5), Roosevelt (18-7) and West Seattle (18-5) join the Bulldogs in the Dome. … With defending champion Gig Harbor eliminated at regionals, it appears that top-seeded Prairie (22-2) of Vancouver and Garfield, led by its stifling defense (37.8 ppg allowed), are on a collision course to the finals. … Butler-bound Oumou Toure might be the top talent in the tournament, leading Kamiakin (22-2) into Thursday’s quarterfinals. Toure averages 23.5 points, 10.5 rebounds, 4.5 steals and 2.5 assists and is part of a group of five seniors who finished fourth place as freshmen and fifth the last two seasons. Top players: Dalayah Daniels, Garfield, 6-3, F, Jr.; Jasmine Gayles, West Seattle, G, Sr.; Oumou Toure, Kamiakin, 5-11, G, Sr.; Tiarra Brown, Bethel, 5-10, G, Sr.; Aspyn Adams, Mount Spokane, 5-9, G, Sr.
Last: Prairie, back at state for the 22nd year in a row, comes off its 22nd consecutive league championship, taking the top spot in the Greater St. Helen’s League. The unselfish Falcons, who average 18 assists per game, are led by a group of three senior who have played varsity all four seasons — GSHL 3A Co-MVPs Brooke Walling and Cassidy Gardner and Mallory Williams.